In 1989, the Ontario Association of Architects invited each architecture school in Ontario to contribute a puppet theater to its 100th anniversary celebrations in Kingston. The Ready-Made Puppet Theater was the University of Waterloo’s contribution, after being selected through an intramural design competition. The Ready-Made Puppet Theater is constructed from a (newly purchased!) port-o-potty shell. It is a manifesto in favor of ‘adhocism’ and a nod to Marcel Duchamp’s idea of the ready-made, while referencing the University of Waterloo’s 3rd year ‘Sweet’s Catalog Project’. Why make things from scratch in a society of plenty? 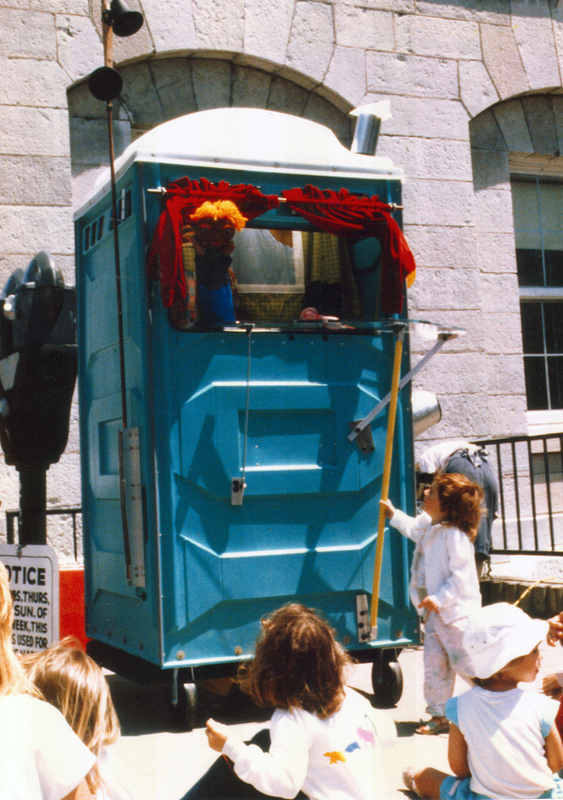 To transform the port-o-potty into a puppet theater, a proscenium was cut out, red velvet stage curtains were hung, a transparent acrylic stage installed, and wheels and wheelbarrow handles added. The theatre was assembled (not to say “built”) and delivered in less than 48 hours by a team of a dozen students from the class of ’89. After the festival ended, the theatre was donated to one of the puppeteers.